The content of this article provides interesting history, facts and information about the Weapons and Armor of the Gladiators who fought in Roman arenas such as the Colosseum. Gladiator Weapons were taken not just from the Romans, but from the nations that they conquered. The Roman crowd of spectators in the Colosseum enjoyed being reminded of Roman conquests and loved any gladiatorial fights that provided some sort of novelty. The pairing of gladiators were important and ironically the Romans expected to see 'fair play' in the gladiatorial combats. Matched pairs of Roman gladiators of would ensure that one fighter was hampered by heavy armor whilst the other was lightly armed. One gladiator might have freedom of movement but with little armor, or no armor to protect him. The gladiator matched against him might be more heavily armed and protected but restricted in his movements by his armor. There were therefore approximately 30 different types of gladiator who specialised in using specific weapons, armor and shields. The gladiator weapons were there linked with the armor that they were given. This included the shields, some of which were used as weapons against their opponents. The list of Gladiator armor Gladiator Weapons details the Latin name used for the weapons with a short description. The following facts and information provides details of the Latin name used for the weapons with a short description of each of the weapons, together with useful information about the armor worn by gladiators. The sica, or siccae, was a curved scimitar, a short, curved sword, with a blade about 16-18 inches long - the most common Dacian sword (The inhabitants of Dacia are generally considered as belonging to the Thracian nations). The sica was commonly used by a Thrax (Thracian) gladiator and the Dimachaerus. Fascina were long, three-pronged, metal tridents (harpoons) that were used by the gladiators called the Retiarii. The Gladius was the 27 inch short straight sword, broad towards the handle, after which the gladiator was named. The gladiators who used the gladius were those who were armed with body-shields such as the secutor, myrmillo, hoplomachus and the dimacheris. The Gladius Graecus was a leaf-shaped short sword originally used by the Greek hoplites. Hoplites were the citizen-soldiers of the Ancient Greek City-states which included Sparta. 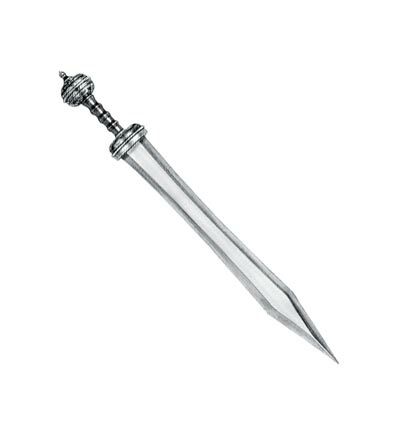 The Gladius Graecus was used by the Busturius and Hoplomachus gladiators. A dagger, weapon of last resort of the Retiarii. The handle was shaped to fit snugly in the hand, and the blade was made from either iron or bronze and was pear shaped. The Pompeianus was a sword used the middle of the first century AD with parallel cutting edges and a triangular tip. The acinaces was a single edged cavalry sword. The Spatha was a long sword, over 75 cms, used by the Roman cavalry and the type of Gladiator who rode on horseback. A smaller version of the spatha sword was used in close combat use in the Roman army before the gladius was introduced. Small shield which was used for thrusting and smashing. Hasta (pl.Hastae) is a Latin word meaning spear. The hasta was not thrown, it was used for thrusting and approximately six feet in length. The verutum (pl.veruti) was a short, light javelin approximately 1.1 meters long used for skirmishing. The ancient term for the javelin was verutum. Venabulum: A 6ft long thick wooden spear reinforced with long, winged head with an iron point. Used by Venotores for hunting and also by Essadari. Another name of a weapon of this type was the menaulion which was used by strong foot soldiers in the Roman army. The pilum (plural pila) was a heavy javelin approximately two meters long with a pyramidal head. The spiculum replaced the pilum c250AD as the main throwing spear. Pila were sometimes referred to as javelins. The lancea was a short javelin, or spear, used for throwing. Plumbatae or martiobarbuli were lead-weighted darts often stored in the hollow of the shield. The normal weapon of Roman archers was the classic composite bow made of horn, wood, and sinew held together with hide glue. The bows were able to produce a draw weight of nearly 160 lb (72.5 Kg). A contus could be an infantry pike or a riders lance. These were long, heavy, two-handed weapons. The content of this Gladiator Weapons category on life in Ancient Rome provides free educational details, facts and information for reference and research for schools, colleges and homework. Refer to the Colosseum Sitemap for a comprehensive search on interesting different categories containing the history, facts and information about Ancient Rome. Just like the subject of Gladiator Weapons there is hardly a page of Roman history and the Romans that is not, on some way, connected to the Roman Colosseum which became a symbol of Rome, its society, culture and life.